The U.S. Air Force's WGS-8 satellite launches atop a United Launch Alliance Delta IV Medium rocket on Dec. 7, 2016. The U.S. Air Force has launched the newest member of the military's core communications-satellite constellation. 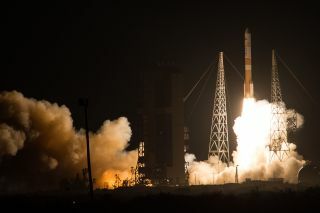 The Wideband Global SATCOM-8 spacecraft, or WGS-8, lifted off atop a United Launch Alliance (ULA) Delta IV Medium rocket today (Dec. 7) at 6:53 p.m. EST (2353 GMT) from Cape Canaveral Air Force Station in Florida. The Delta IV deployed the satellite as planned at 7:35 p.m. EST (0035 GMT on Dec. 8), as the duo were flying over Madagascar, ULA representatives said. You can see more launch photos for WGS-8 here. As its name suggests, the $425 million WGS-8 satellite is the eighth member of the WGS constellation to reach orbit. The network, which will eventually consist of 10 spacecraft, is "the backbone of the U.S. military's global satellite communications," Air Force officials have said. "WGS provides flexible, high-capacity communications for the nation's warfighters through procurement and operation of the satellite constellation and the associated control systems," Air Force officials wrote in a WGS fact sheet. "WGS provides worldwide flexible, high data rate and long haul communications for marines, soldiers, sailors, airmen, the White House Communication Agency, the US State Department, international partners, and other special users." Those international partners are Australia, Canada, Denmark, Luxembourg, the Netherlands and New Zealand. A United Launch Alliance Delta IV Medium rocket blazes a light trail through the sky on Dec. 7, 2016. The WGS satellites, built by Boeing, set up shop in geostationary orbit about 22,300 miles (35,890 kilometers) above Earth's surface, where their orbital velocity matches the planet's rotational speed. The spacecraft therefore hover over the same patch of the planet 24 hours a day — a favored orbit for communications satellites, because it allows them to stay in constant contact with equipment on the ground below. The currently operating WGS satellites can support data-transmission rates up to 8 gigabits per second, ULA representatives said. The more-advanced WGS-8, which weighs about 6.5 tons (5.9 metric tons), may be able to top 11 gigabits per second, they added. The previous seven WGS satellites launched in October 2007, April 2009, December 2009, January 2012, May 2013, August 2013 and July 2015. All 10 satellites in the constellation, which launch atop ULA Atlas V or Delta IV rockets, should be aloft by 2018, Air Force officials have said.